In case you’ve forgotten, black people are beautiful. and they share this human experience with all of us. Let’s strive for our best life and for the best life for others. 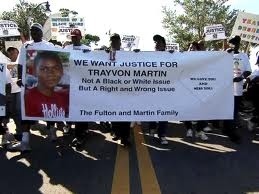 I’ve seen T-shirts and posters that are fueled by anger, focusing on proving that Zimmerman is racist or a monster. In that, hate is begetting more hate. We have to focus on making things right. How can we make this right, right now? Let’s all focus on that and take one step at a time. My idea? Arrest Zimmerman for his crime of taking life so that people of America can feel that the bottom line laws apply to us all because the law is inclusive of all human life here in this country. Once, that is done, we can move towards further resolution. Any ideas?